King George VI's apparent fondness for sapphires was notably documented through gifts to his wife and his eldest daughter, with examples like the Queen Mother's Sapphire Flower Brooch and the George VI Sapphire Suite still in use today. That preference for blue stones and the preference he and his wife had for Cartier jewels came together in this bracelet, which he gave to Princess Elizabeth in 1944 as an 18th birthday present. 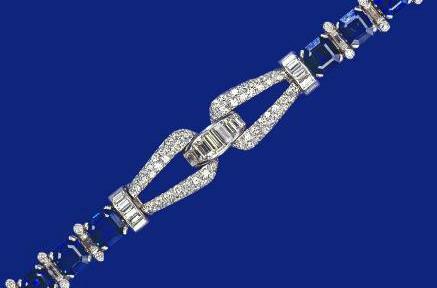 The bracelet features square sapphire stones separated by diamond links and accented with diamond loop details, a delicate gem that could be used for special day events (such as the christening of Princess Anne in 1950, shown above) or for evening events. Today, though, it seems to fall between categories when it comes to public appearances: dressier than what The Queen wears during the day now, but not as big as the sapphire bracelet she acquired to wear with her George VI and Modern Sapphire Parure. Plus, some of the sapphire sets she's been given over the years (the Dubai Looped Sapphire Demi-Parure, the Sapphire Tassel Demi-Parure) have their own matching bracelets. 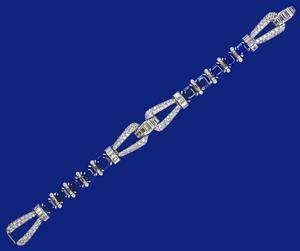 We don't see much of this birthday bracelet, and I think it's ripe for a resurgence.